In a Dateline NBC special on Thursday, May 7, Tom Brokaw will share insights from his battle with multiple myeloma. Go behind the scenes as he interviews his Mayo doctors. Tom Brokaw chuckles when asked what kind of patient he was. In many ways, he was like any other patient faced with a difficult diagnosis. He had some questions. His questioning skills, of course, have been honed by many years of interviewing everyone from regular folks, to celebrities, to world leaders. But perhaps even more important than the quality of his questions was his willingness to ask them until he got the information he needed. Even so, Brokaw admits he didn't fully understand what he was up against when he was diagnosed with multiple myeloma two years ago. That cancer diagnosis and his battle with the disease are the focus of Brokaw's memoir set to come out on May 12 called, A Lucky Life Interrupted. The publisher, Random House, describes the book as one that "takes us through all the seasons and stages" of that journey — "times of denial, acceptance, turning points, and courage." The book is based on the journal Brokaw kept, in which he looks at his experience "as a journalist, determined to learn as much as he could about his condition, to report the story, and help others facing similar battles." He'll do much the same in a Dateline NBC special to air this Thursday at 10 p.m. EDT/9 p.m. CDT called, not surprisingly, "Tom Brokaw: A Lucky Life Interrupted." 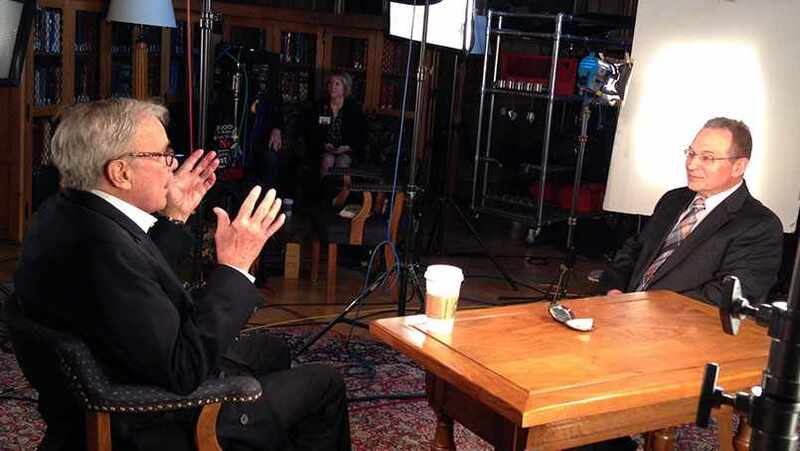 Brokaw was at Mayo Clinic recently filming interviews for the Dateline special -- talking with some of the doctors involved in his diagnosis and treatment. We got a chance to be a fly on the wall and even ask a few questions of our own. (No pressure.) And while Brokaw was in his usual interviewer's chair, the conversations with his doctors were give-and-take, much like what he'd suggest a good doctor-patient discussion should be. Part of his goal, he tells us, is to "raise the level of dialogue between the patient and physician." And he says he wants to help others "have a kind of comfort level in talking to their doctors, asking the questions that need to be asked." We listened in as Brokaw talked with Andrew Majka, M.D., his internist, about why he suspected something more was at play during one of Brokaw's visits about his back pain. He also asked about the somber look on Dr. Majka's face during one particular appointment. Dr. Majka's reply revealed he was thinking about more than the diagnosis. "I'd gotten to know you. You were alone. Your wife wasn't here. Your daughter wasn't here," he said. And when the good doctor considered that in conjunction with a diagnosis he described as like being "hit with a cruise missile with multiple warheads," he says his thoughts turned to, "How am I going to be present with you" in dealing with that news. Brokaw also talked with Morie Gertz, M.D., his oncologist, about why his prognosis looked beyond the statistics, which would suggest Brokaw might have had five years to live. "You said, '8 years, but I think that you can beat this,'" Brokaw recalls. Dr. Gertz indicated his response had much to do with the rapidity with which new drugs are being developed to combat the disease. And when asked about a cure, Dr. Gertz suggested it might be more helpful to think in terms of disease suppression. "I'm not sure that cure is essential. We just need to be able to manage it," he said. "I can't cure high blood pressure … and I can't cure arthritis, it has to be managed." You can hear more from Brokaw, his family, and his doctors at Mayo and elsewhere, in the Dateline special. And be sure to watch our interview with Brokaw below, share your comments, and share this story with others. Below is a bit of behind-the-scenes footage from Tom Brokaw’s visit to Mayo Clinic to talk with his physicians.